The Native American Leadership Program of the San Diego Indian Center and SCAIR cosponsor with the Title VII Indian Education Program held the Annual End of the Year Ice Cream Party on Wednesday, June 4, 2008, San Diego Unified School District, SDUSD, Indian Education Culture Arts Program at Oak Park School, 2606 54th St. This end-of-the school year event is an opportunity for enrichment and to develop self esteem from positive validation of student accomplishment. During the year the students are encouraged to develop habits of observation, questioning, and listening. Now is the time for fun, laughter games and yummy delights. Board games and card games were distributed to all the students and their families at the beginning of the evening. Games are a fun way to remember that learning is a lifetime experience. Melissa Aleman called out the ever-popular Bingo game. The general concept of a weekly Family Night was introduced at this special event. Family Night is to spend an evening once a week where the family is together having a meaningful experience together. The basic principles of Family Night involve everyone together. Additional activities such as walking or hiking, playing board games, working together in the yard, being involved in community service projects, visiting relatives together. When a family decides on Family Night, each member commits to making it work. That means we have to say "no" to conflicts. Teenage kids need to have the night off from work and school activities. Moms and dads need to say no to work projects, phone conversations, and athletic events. Athletic teams understand that practices would have to not conflict and if it means that someone doesn't make the team, and then the choice is made for family. This is one of the hardest parts of a family night program, but it is essential. All the board games were distributed to all the families to take home to start their Family Night this summer. Organized by SDUSD Indian Education Community Liaison Vickie Gambala. 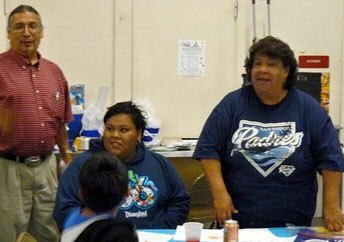 With the cooperation and support of the Native American Leadership program of the San Diego Indian Center and SCAIR, Southern California American Indian Resource center have enabled the Indian Education program to deliver the culture program and selected special events like this ice cream social. Daniel Blackfox, Dedrie Iron Cloud and Carla Trouville are recognized as this year’s Culture Arts Program outstanding parents Chuck Cadotte presented awards to these parents in recognition of exemplary role models and their efforts promoting education and learning and sharing their knowledge of their Indian culture and heritage with others participants of the Culture Arts. A special award was also given to Bella Flores for her outstanding participation and her passion in learning from her beadwork to her story telling projects. All these efforts are to acknowledge our Tribal cultural traditions and assist the educational opportunities for our Indian students. Enjoy these images of our Indian students, parents and community’s members like our good friends: Randy & Bonnie Edmonds, Ben Nance, Laura Workman, Paul Razo and Henry Mendibles at this festive ice cream social event. Vickie Gambala gave a brief report on the summer program that will be provided for the all the students in the program. A reading and math program will be available for the students in grades K-5^th grade at the SCAIR Learning Center in San Diego, and a powwow dance program will be provided to all the students who want to learn how to dance. Material and instructions will also be provided to the students for their parents to make. More information will follow very shortly by mail or e-mail. Please CONTACT SCAIR or the Indian Education program 858-627-7362 or the Indian Human Resource Center 619-281-5964 with your E-mail address for more information.